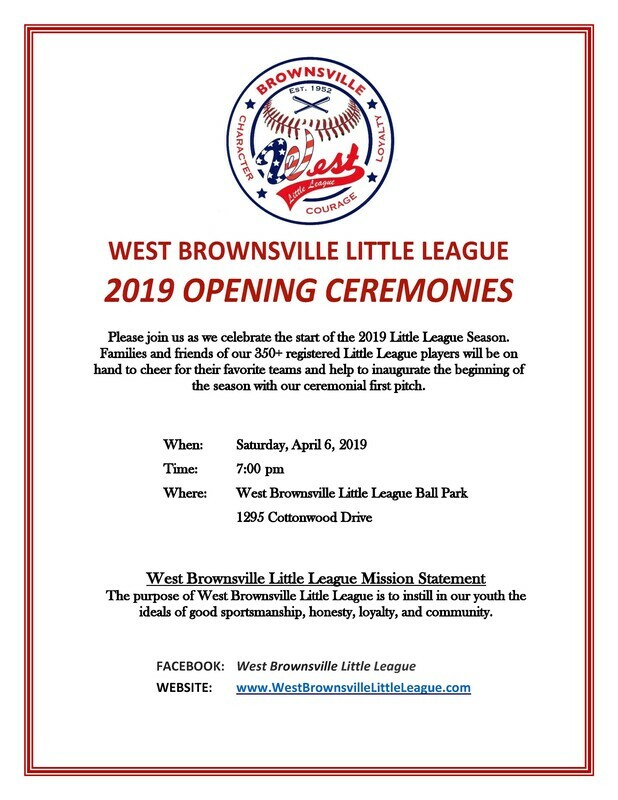 West Brownsville Little League is a nonprofit organization dedicated to encouraging good sportsmanship, honesty, loyalty, courage and respect for authority amongst our community's children through participation in competitive baseball and softball. This clinic is designed to go over rules that are unique to Little League Baseball / Softball, including recent changes to last year's rules. It is designed to give ALL coaches, regardless of their level of experience, a refresher and better understanding. ​Participants will have the opportunity to ask questions and take notes. The class will be taught by our Head Umpire, George Hinojosa. Bring something to write with to take good notes for future reference. Clinic should last approximately 2 - 2 1/2 hours and is highly recommended for ALL coaches and assistant coaches to attend. There is no charge. Tryouts, draft, and team selections were completed this Saturday. With the exception of 1-2 teams, all teams now have coaches. Parents should be getting calls in the next few days for information on practices, if you haven’t been called already. If you are a parent on a team without a coach, please consider coaching the team until a replacement can be found, so that there are no delays in getting things going. Contact Coach Coordinator, Rusty Brock, if you are willing to help. Schedules should be done in about ten days. After weeks of scheduling and rescheduling, it looks like the fields at WBLL Park are finally dry enough for Tryouts to take place today and tomorrow, so let's keep our fingers crossed. * Please note that TRYOUTS are only for players league age 9-12 who will be playing in the Minor's or Major's Divisions and are not already on a Major's Division team. Players league age 8 who have requested to play up in the Minor's Division must also attend. It is mandatory for all players to attend one TRYOUT session only. Players who do not attend cannot be chosen by a coach and will be assigned to a team at random by the player agent. Players should get there early to warm-up on their own or with a friend. For additional details on TRYOUTS, please refer to the TRYOUTS tab on our website. Registration has been extended for league age 13 year old baseball only for one week. Players can register online or in person during one of our tryout events scheduled for this week. This is for 13 year old baseball only. All other divisions are closed. This rescheduling thing will end soon, we promise, but only mother nature knows for sure. Our tryouts are now scheduled to take place on Friday (6pm) and Saturday (9am), March 22-23, at WBLL Park. Tryouts are only for players 8+ who will be in the Minor's or Major's Divisions and who are not already on a Major's Division team. It is only required that players attend one Tryout session. For more information on Tryouts, please click on the Tryouts tab. Coaches for the T-Ball and Coach-Pitch Divisions only will be meeting on Wednesday, March 20 - 6:30pm at Bello Amanacer Adult Day Care, located at 556 West Elizabeth St. Coaches will be receiving team rosters and supplies, so that they can get practices underway as soon as possible. Due to the continued rainy conditions, the Tryouts that were rescheduled for this week, Tuesday/Wednesday, have now been moved to Wednesday/Friday, starting at 6pm. Even if it stops raining, the soggy fields may make things hazardous. We have been checking with our friends at the city and school district on the possibility of using one of their gyms or artificial turf facilities for a few hours to get them done, but so far no luck. Please check back here for further updates on Wednesday. Due to the rain, tryouts have been rescheduled for Tuesday/Wednesday, March 19-20, starting at 5:30. Please check back for any further updates that may be impacted by the weather on those days. We will be registering for only a few more days. This Sunday, March 17, we will be at WBLL Park from 10am - 2pm. This will be our last live registration day. Exact change will be required. If you have any pending documents or payments that were requested during the online registration process, this would be your opportunity to get this done. Your registration is not complete without them. 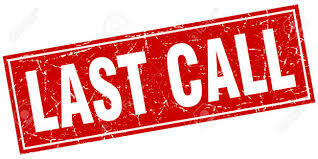 Online registration will continue to be available 24/7 through the end of the day on Monday, March 18. However, registration is likely to close earlier than that once all available team spots are filled. Mandatory Tryouts for ALL players league age 8 and older who are not already on a Majors' Division team are scheduled for Monday / Tuesday, March 18-19 starting at 5:30pm. In the event of rain cancellation on either of those days, one extra day is scheduled on Wednesday, March 20, starting at 5:30pm. Players that do not attend a tryout, may not be drafted by a coach. For additional information on tryouts, please click on the tab Registration / Tryouts / Timeline that can be found on our website. For additional notices on changes, please check our website on the day of the event. Get a leg up on the competition by making the most of your team's practice time. This clinic was put together to help coaches design effective practice routines and drills to get the most out of limited practice time with youth players. The class will be taught by some of our more experienced coaches that have been part of youth baseball for quite a while. Clinic should last approximately 1 1/2 hours and is highly recommended for all registered coaches and assistant coaches, especially those that are fairly new to youth baseball / softball. Hamburgers and/or BBQ will be served following this clinic. There is no charge to attend, but an RSVP would be appreciated by contacting Coach Coordinator, Rusty Brock, at 956-640-0080 via text, so that we can plan accordingly. This clinic is designed to go over rules that are unique to Little League Baseball / Softball, including recent changes to last year's rules. It is designed to give ALL coaches, regardless of their level of experience, a refresher on Little League rules. Participants will have the opportunity to ask questions and take notes. The class will be taught by our Head Umpire, George Hinojosa. Bring something to write with to take good notes for future reference. Clinic should last approximately 2 - 2 1/2 hours and is highly recommended for ALL coaches and assistant coaches to attend. There is no charge.